Apple iPod Touch (5th gen) review | What Hi-Fi? The last time we had a significant upgrade to the iPod Touch was in September 2010, when the 4th generation was released. Apple’s been busy in the two years since, what with various new iPhones, iPads and iOS updates, so it’s finally time for the iPod Touch to get its new update. And what an upgrade it is: if you’re already familiar with the iPhone 5 and the new iOS 6, these updates may not feel too groundbreaking. 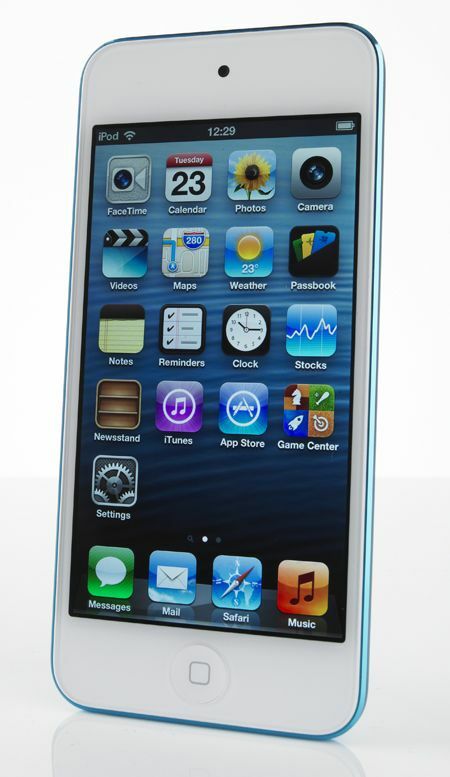 But as a leap from the 4th generation to this new 5th generation iPod Touch – well, it’s a significant upgrade. The Apple iPod Touch was our runaway Award-winner as the best all-round portable media player in 2011 – but this new model raises the stakes even further. In fact, the new iPod Touch feels like a completely new product. Every aspect has been polished and streamlined to make it an even sleeker and better-performing media player than ever before. Let’s start off with the most obvious upgrade: the design. The 5th-gen Touch has the taller 4in screen of the iPhone 5 – but with no need for cellular components, it’s a whole lot slimmer and lighter. The new Touch weighs in at a feathery 88g and is just 6.1mm thick, compared with the 4th generation’s 101g and 7.2mm. It’s built from one uniform piece of anodised aluminium – the same material used in Apple’s MacBooks – which makes it look and feel wonderfully streamlined and smooth. And while it may feel light and delicate, its tough shell doesn’t scratch easily, and is also grippier than the previous generation's. Similar tweaks have been given to the volume control and power buttons, while the 3.5mm headphone jack has been relocated from the bottom right to the left to mimic the iPhone 5 design. For the first time, both the 32GB and 64GB Touch models are available in the same bright candy colours as the Nano and the Shuffle. We tested the 64GB version. The colours – slate, silver, pink, yellow, blue – have a beautiful lustre, while if you buy the exclusive red version, Apple will give a portion of the purchase price to the Global Fund to help fund AIDS programmes in Africa. A couple of new and noteworthy accessories come bundled with the iPod Touch. First of those is the Lightning to USB cable – a brand-new connector to account for the slimmer design of the Touch. We’ve spoken about this new connector at length during the launch of the iPhone 5, and while its reversible design is welcome, it does mean that it won’t work out of the box with existing speaker docks and other devices that use the old 30-pin connector. There's a way around it, and it involves splashing out a further £25 for a Lightning to 30-pin adapter (right) to use with existing models. If you’re worried about letting your new Touch slip and tumble from your hands, Apple’s introduced the iPod Touch Loop to keep it close and safe. We’re still a bit sceptical about the practicality of this feature. After a few (very) tentative swings, we’re assured that the Loop does stay securely attached to the metal button at the back, but we'd be reluctant to leave any product of this type and price dangling about our wrists for the benefit of pickpockets and pavements alike. Also in the box are a pair of Apple's new EarPod in-ear 'phones, as launched with the iPhone 5. More on those later. The 4in screen display changes the game considerably. The stunning Retina display has a resolution of 1136x640 pixels at 326 pixels per inch, so there’s now more space to enjoy your videos, games and web browsing. Along with a 5th row of icons, the bigger screen also allows for a 16:9 aspect ratio (compared with the 4th generation’s 2:3) and means you can watch widescreen HD videos that fill the screen nicely without any letterbox effects. The iPod Touch gains the dual-core A5 processor chip found in the iPhone 4S, the iPad 2 and the new iPad Mini: Apple claims twice the processing power and seven times faster graphics when compared with the 4th gen – and we’re inclined to believe that: the Touch is swifter and more responsive than before. Every swipe and tap feels fluid and intuitive, and all actions are just that bit speedier. Apps open up instantly, multi-tasking is a breeze, and the keyboard response is swifter as well. The interface feels closer to the glass screen as well, and overall it’s a joy to use. Browsing websites using Safari is faster too – the Touch uses built-in 802.11n Wi-Fi connectivity, as well as the latest 4.0 version of Bluetooth. Pages load quickly, and it renders just as instantly for both texts and photos. Picture quality is much sharper than before. Pull up any website, our very own whathifi.com for instance, and you’ll find the text remarkably clear and sharp to read, even when zooming all the way in. Of course the new Touch gives you access to all the games and apps available for the iPad and iPhone products. From various photo-editing apps like Instagram and Vintique to games such as Angry Birds Space and Tiny Wings – they all feel easier to use thanks to the quicker reaction times of the Touch. And with Apple’s latest iOS 6 software update, you have a host of new features introduced to the iPod Touch. It now sports the swipe down notification centre, and with Facebook and Twitter integration, you can share your photos and various content with your friends with just a few taps. What's more, if you’ve got an Apple TV set up, AirPlay and AirPlay Mirroring means you can instantly stream anything you’re watching or playing on your Touch straight to your TV screen and speakers. Other notable features include Passbook (store and use your movie tickets, boarding passes, and loyalty cards), Siri voice control (you can ask Siri to play music as well as ask the time and check the latest football scores), and various tweaks to Safari, Mail, iMessage, Photo Streams, iTunes and Apple stores, and the in-built Apple apps. Oh, and there's the infamous Maps app – but it's hoped Apple is working on that! It’s all about firsts for the iPod Touch, and the Touch now has Apple’s iSight camera. The 5 megapixel camera at the back now has Face Detection, a rear-facing illumination sensor, and an LED flash to capture photos in low-light conditions. A side-by-side comparison with pictures taken by 4th and 5th generations shows the step-up in image quality – pictures are sharper, clearer, and have more detail and natural colours. Another new iOS 6 update is the Panorama feature, which lets you take sweeping 240 degrees shots – vertically and horizontally – in one smooth sweep. Just make sure you keep your hands steady! Colours are more dynamic, with punchier and richer colours with a greater degree of subtlety. Apple claims a 44 per cent increase in saturation, and an 800:1 contrast ratio – four times that of the previous generation. The 4th generation had a blue tinge to its colour that showed up especially in the whites, and in our review back in 2010 we also mentioned how we wished the the black levels were ‘deeper and richer’. The new Touch takes care of all our reservations: the whites are clean and punchy, while the blacks are inky deep. Whether you’re playing Fruit Ninja, watching Doctor Who in HD on BBCiPlayer or just checking the weather app, the entire screen is filled a with crisp, natural and noise-free picture – it’s definitely the best the Touch has ever looked. But it does beg the question: if watching videos is your main priority, wouldn’t you want something a bit bigger than the Touch? The Touch’s closest rivals are now in the small tablet market, and even the increased screen size to 4in isn’t a match for the 7in screen of the Google Nexus 7 – which is almost as portable and has great picture quality for HD videos. In comparison, the Touch feels just a little too small to be fully enjoying watching HD films or TV shows. Battery life has been given a boost when it comes to videos. While you still have 40 hours for music, the new Touch’s battery life is now 8 hours for video (the 4th gen had 7 hours). We spent a full day watching it, and can happily report that we weren’t desperately reaching for the charger by the end. One of the weakest aspects of Apple’s products had always been the average-sounding, ill-fitting and eternally tangled earphones that Apple has been bundling in with its iPods and iPhones for years. Not any longer: the new Touch comes with new earphones – called EarPods, which cost £25 if bought separately. And you know what? They’re pretty good. The redesign incorporates paper-based drivers and a new, unusual shape that’s meant to fit all ears – and while it’s a much more comfortable fit than the old earphones, you can get in-ear phones that fit more snugly. Sound quality is leaps and bounds ahead of the old earbuds. Instead of shouty, bright and leaky sound, you get a well-balanced sound with plenty of detail and minimal leaking. Basslines are punchy and deep which complement the strong highs nicely – it’s a much more organised and enjoyable sound to listen to. They’re still not the last word in clarity and precision, though. Our multi-Award winning SoundMagic E10s are preferable at just £35. However, for a proper step up in sound quality to get the best of out of the iPod Touch, we’d recommend getting a pair of the Beyerdynamic MMX 101iE in-ears at £100. A handy little feature is the colour-coded volume bars that appear only when you’re listening with headphone: the bars turn yellow and then danger red to warn you when you're reaching high volumes. When we named the 4th generation iPod Touch the ‘Best Media Player’ in our 2011 Awards, we said it sounded ‘more detailed and more exciting than ever’ and that it’d take quite a lot to beat it. Play Adele’s Someone Like You, and you’ll find that her rich vocals are conveyed with an extra layer of fine detail, with a clean and direct sound that seems like she’s singing right to you. Instruments are separated nicely, with leading edges of notes sharpened that bit more – it delivers Sbtrkt’s Wildfire with plenty of attack and good rhythm. Some might find this sharpened sound a bit too clinical – the 4th generation’s slightly rounded notes has a slightly warmer feeling which can be nicer to listen to over long periods of time. But it’s hard to ignore the clarity and enthusiasm behind the new Touch’s dynamic sound. Whether you’re using the EarPods, higher-quality headphones or listening on its own, the new Touch is most definitely a more polished and better-sounding player. As a dedicated media player for your music, games, videos, and web browsing, the new Touch is clearly ahead of the previous generation. However, the market has changed in the years since the iPod Touch was first introduced. Already a somewhat niche product, especially when placed against iPhones, it becomes even more niche with the advent of smaller tablets such as the Google Nexus 7 and the newly launched iPad Mini. There are two key factors: screen size and price. The Google Nexus 7 has certainly shaken things up by hitting the sweet-spot of a 7in screen – small and light enough to be easily portable, but also having a bigger screen than smartphones to enjoy watching videos, browsing the web and playing games. And there’s the price: the Nexus 7’s starting price is £160 for 8GB, and then goes to £200 for 16GB, while the Touch starts at £250 for 32GB – which is now looking rather expensive. There’s the new iPad Mini to take into account as well. While we have yet to test it, the specs make it seem that the iPod Touch’s main competition is in-house. The Mini has the same A5 processor, anodised finish and full functionality and features as the new Touch, but with a larger screen size – 7.9in against 4in. Crucially, the entry-level 16GB model is going for £270 – a direct price rival for the new Touch. So where does that leave the iPod Touch? We can see it as an ideal option if you don’t use a smartphone, and/or want a separate portable device just for all your music, video and games. The Touch does have arguably better graphics and sound quality, even compared with its Nexus 7 rival. Put it altogether, and we think that the iPod Touch merits a full 5 stars – but only just. It’s got some stiff competition surrounding it, but there’s no other product like it – it’s still the best of its kind.